Alan Turing is widely considered to be the father of computer science. He cracked the German Enigma Codes in World War II, which saved countless lives and is estimated to have ended the war in Europe two years early. His genius with computer processing showed when he wrote software to play chess before there were computers powerful enough to run his software. His “Turing Test” for determining true artificial intelligence is well known by any student of computer science. Alan Turing was gay. Due to this, he was convicted by a British court in 1952 and given the choice of either going to prison, or taking forced estrogen injections. He chose the latter and committed suicide two years later at the age of 41. 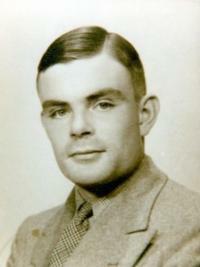 Although it was widely known Turing was gay during World War II, he was too valuable to the war effort for them to act upon their anti-homosexual laws until after the war was over. I have to wonder what contributions were lost due to the unjust treatment of Alan Turing. The English have long had the tradition of leaving petitions on the step of their Prime Minister’s office at 10 Downing Street. This is a tradition that has been updated to take advantage of the Internet. It would be appropriate if our government institutions followed suit. I’ve never been a fan of online petititions, because I think they are widely ignored. The English model of not only respecting them, but hosting them, gives the idea much more weight. A 10 Downing Street petition was started demanding an official apology for the treatment of Alan Turing. On Thursday, Prime Minister Gordon Brown issued an official apology. It is worth reading.